2007/03/03, the Quasar saxophone quartet performed two pieces of Frank Zappa, arranged by Walter Boudreau at the MNM Festival in Montréal. "Impassioned by the music of our time, the Quasar saxophone quartet is dedicated to premiering and promoting contemporary music that is multi-dimensionally conceived. Celebrated for its energy, audacity and exceptional technical ability, Quasar explores different aspects of artistic creation, from instrumental music to the multi-disciplinary, from mixed media works to instrumental theatre. The quartet reserves pride of place for a number of Québécois composers, with whom it has formed solid partnerships. It aims to contribute to the development of our musical language and provide a platform for new music experiments, exploration, and production. At the same time, Quasar constantly seeks out new works from the international scene, which are then frequently integrated in its repertoire. 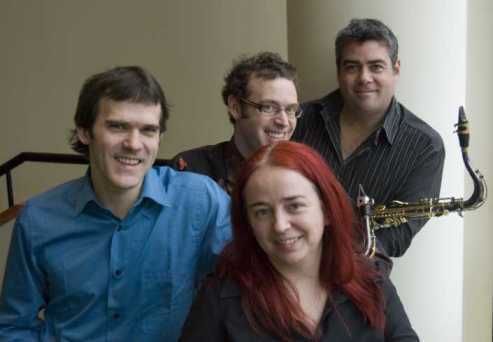 The group’s concerts are regularly broadcast by Radio Canada’s Chaîne Culturelle, and it recently launched its first compact disc, on the ATMA label, the excellence of which was underscored by its nomination for a Prix Opus for the year 2000. Quasar is the ensemble in residence for the Société de Musique Contemporaine du Québec and is supported by the Conseil des arts et des lettres du Québec, the Canada Council for the Arts, and the Conseil des arts de Montréal." Montréal Nouvelles Musiques Festival, Montréal. "Les (nouvelles) boîtes de Pandore!" The Quasar saxophone quartet will begin with music where the electronic meets the conventional with premieres of works by Jean-François Laporte and Zack Settel. To these two pieces by a couple of particularly original composers will be added arrangements of works by Frank Zappa by Walter Boudreau. This Montreal quartet promises not only to surprise, but also to transport its listeners!